My husband has held the Southwest Airlines Companion Pass before and we missed it once it expired. When the opportunity came up to get it again early in the year, I jumped at the chance. A few years ago our family had the Companion Pass under my husband’s Southwest account. We took full advantage of this benefit and made numerous trips to visit family in Florida and went on holidays in the Caribbean. Our Companion Pass expired at the end of 2016 and we decided that this time I would apply for the cards next, but as we were both also applying for the Chase Sapphire Reserve in 2017, the 5/24 rule came in to play and the Southwest cards would have to wait. This is a great time to go for the Companion Pass because of how early it is in the year. The pass is valid for the rest of 2018 and all of 2019, meaning you can really maximize your pass over the next two years. In addition, there is very little work that will need to be done to earn yourself a Companion Pass. Right now the sign up bonuses for the cards are enough to get you there once you hit the spending requirements. For clarity, LiveAndLetsFly.com does not sell credit cards. Our writers use them like many of our readers for travel advantages, but we do not make a commission. As such, links direct to Chase/Southwest which pay no one. If you have a favorite travel blogger that offers cards, consider using their link. For instance, both the Southwest Rapid Rewards Premier Card and the Southwest Rapid Rewards Plus Card have a bonus of 50,000 points when you hit $2,000 in spend in the first three months, while the Southwest Rapid Rewards Premier Business Card bonus is 60,000 points after $3,000 in spend in the first three months. With one personal card and one business card bonus, you’ve hit the required 110,000 points needed for the Companion Pass. These cards hold great value not just for the Companion Pass, but also the points. When shopping flights to Florida or the Caribbean, Southwest is rarely on my radar. Now with the points and the pass, it will likely make the most sense for us over the next couple of years. You can also book an expensive ticket far in advance, wait for a sale to hit and then refund the points back into your account. 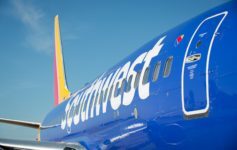 In the past we have also snagged vouchers due to over-booked flights while traveling on points and Companion Pass- a great deal for us, but may not happen again on Southwest Airlines. Southwest flies direct to a lot of places we want to go and direct flights are a real plus. The onboard entertainment options make Lucy happy and they are simple to use. The seats are comfortable, beverage service is fast and you don’t have to worry about baggage fees though we rarely check luggage. We have also encountered some really great Flight Attendants on Southwest. You’ve probably seen them going viral on YouTube with a sassy safety demo or corny jokes- our flights have also been full of happy, smiling crew members. Generally speaking, Southwest is an easy and pleasant experience. More flights on Southwest means maximizing our Companion Pass and points over the next two years. With that said, I am looking ahead at which destinations will make our list. I would like to visit Belize, Grand Cayman, and Cabo. I am also eager to get back to some places we really loved, like Costa Rica. We used our previous pass and points to go to Jamaica, but didn’t have a very good experience at the Holiday Inn Resort Montego Bay. However, with Companion Pass again, we might give Jamaica another try and check out the Hilton or the Hyatt Ziva Rose Hall. I would also like to see Puerto Rico and perhaps Havana if we can find the right route. Companion Pass for our family is more than just the free passenger. The points we earn along the way empower us to travel freely as we want, with very little cost. It also frees us from using our American and United points (which are better used on long haul international itineraries) on flights that can be booked with Southwest at a serious discount. This pass makes traveling in advance or on a whim easy. Do you have the Companion Pass? Where would you go with a pile of points and a companion flying for free? From a private suite in Swiss First to a Southwest companion pass. Poor Augustine!! @Mitch: While I’m sure Augustine could survive just fine on Southwest, this is Carly’s post, not mine.